2012 is the last year for physician practices to receive the full Stage 1 Meaningful Use (MU) incentive payment, but practices still have time to achieve MU and get the full award if they go live by October 3. As of the end of December 2011, the Centers for Medicare and Medicaid Services (CMS) had reported that only 27% of registered providers had attested and qualified for Medicare payments, which indicates the level of difficulty involved in achieving Stage 1 certification. (Stage 2 measures have not yet been fully outlined, but they promise a considerable leap in difficulty compared to the measures required in Stage 1.) This whitepaper provides important advice on the difficulties involved in meeting Stage 1 requirements and how to overcome them. 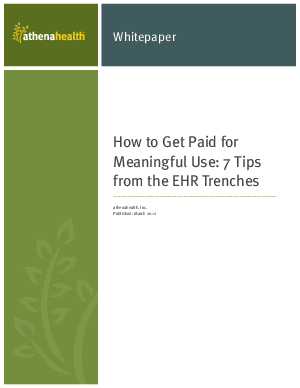 Find out how athenahealth can help you get your Meaningful Use dollars.